If you enter St Swithun’s church from the High Street, through the south door, it is worth turning round, inside, to look above the door, to see the St Cuthman window. The central figure is St Cuthman, pushing his elderly mother along in a wheelbarrow. 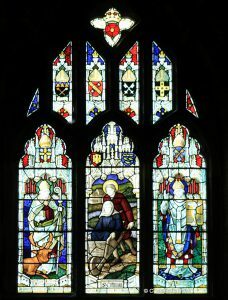 This panel was apparently given in memory of Alice Gunning in 1938, with other sections in memory of Alfred James Lloyd Gunning, churchwarden, in 1940. The window is thought to be from the glass workshop of Burlison & Grylls. By tradition, St Cuthman was a poor shepherd boy in the West Country- some sources say Devon, others Cornwall. (Some say that he came from Chidham, near Chichester, just to confuse things). When his father died, Cuthman was reduced to begging. He and his invalid mother decided to head in the direction of the rising sun. He made a wheeled cart, with rope that stretched from the handles to his shoulders. The ropes broke and he replaced them using ‘withies’. If you google this word, you are taken to a site about the uses of willow. Some haymakers laughed at his efforts, and were cursed with a heavy rainstorm in that field. Some sources say that after this, there was always rain in that field at harvest time. Cuthman decided that when the withies broke, this would be a sign from God to settle there and build a church. This happened at the village now called Steyning, described in the 17th century Acta Sanctorum as ‘a place lying at the base of a lofty hill, then woody, overgrown with brambles and bushes, but now rendered by agriculture fertile and fruitful, enclosed between two streams springing from the hill above‘. There, he built a wooden chapel, probably on the site of the present church of St Andrew’s, Steyning. He was helped by local people, and possibly by Divine assistance in the form of a stranger who helped with a difficult roof beam. The church was finished by 857 AD and King Ethelwulf, father of Alfred the Great, was buried there. Although the church is dedicated to St Andrew, there was a Guild of St Cuthman there until the Reformation, and there is now a chapel of St Cuthman, and a statue of the saint outside. This story highlights the devotion of a young man to God, and to his infirm mother. The river Adur, the South Downs, and the church at Steyning are shown, with coats of arms representing Devon and Sussex. The other sections of the window broaden the story so that it illustrates the spread of Christianity. To the left of Cuthman, St Aiden is represented with the arms of Durham, reflecting the Celtic tradition. To the right, St Augustine and the crossed keys symbol of the Benedictine abbey of Canterbury represent the Roman traditions of Christianity. 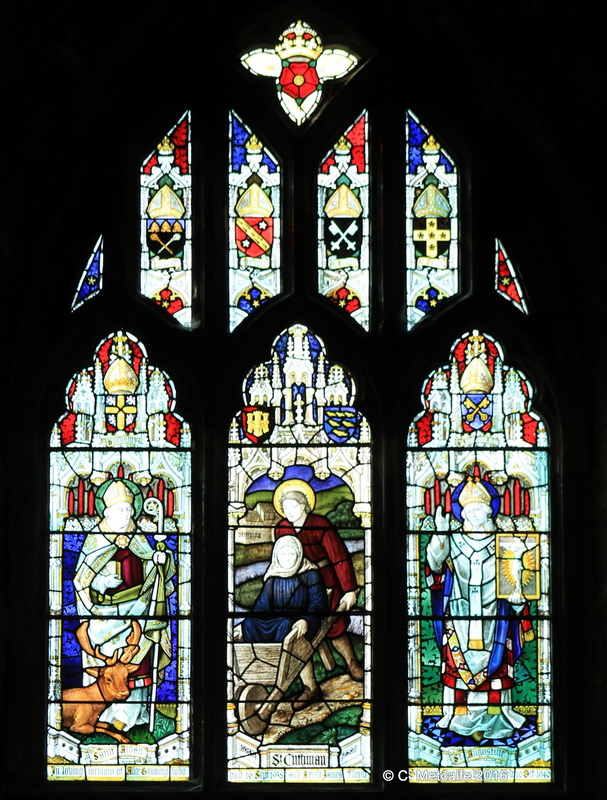 The four shields in the top sections of the window apparently represent the four Welsh dioceses created in Anglo-Saxon times: Llandaff, Bangor, St Asaph and St David’s. The story of St Cuthman was told in the play ‘The Boy with a Cart’ by Christopher Fry, written in the 1930s. The wheelbarrow in the stained glass might be a bit of artistic licence but the story illustrated is rather touching, and in this window, forms part of a display about the spread of Christianity in Anglo- Saxon times.